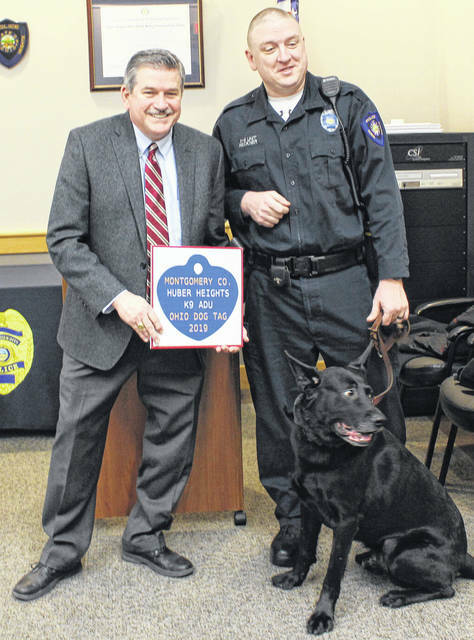 Montgomery County Auditor Karl Keith (left) presents a dog license to Huber Heights K-9 Adu and his handler Officer Mike Reckner. Montgomery County Commissioner Carolyn Rice and Auditor Karl Keith present a dog license to Huber Heights K-9 Eddie and his handler Officer Cory Siegrist. 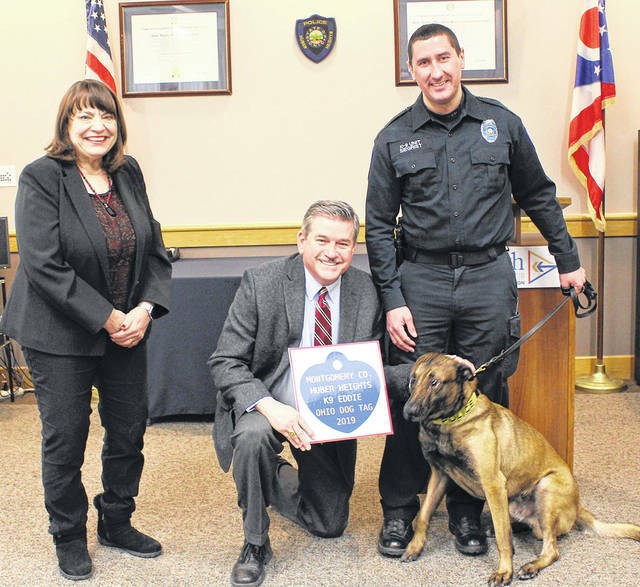 HUBER HEIGHTS — Montgomery County Auditor Karl Keith visited the Huber Heights Police Department on January 17 to present the department’s K-9s with their 2019 dog licenses, honoring the service the dogs and their handlers provide their community. Keith was joined by Commissioner Carolyn Rice to present the licenses. Keith provides dog licenses for free to dogs in police service. There are more than 20 total police dogs in Montgomery County serving in 10 police departments. These dogs are a great asset to the police departments they serve in. They search buildings, perform demonstrations, investigate bomb threats, apprehend criminals and find illegal drugs. Huber Heights has two K-9 teams, Officer Mike Reckner with K-9 Adu and Officer Cory Siegrist with K-9 Eddie. Adu is a 6-year-old Dutch shepherd and Eddie is a 4-year-old Belgian malinois. They are trained in narcotics, criminal apprehension, handler protection, tracking and evidence recovery. Both are trained in minimal force, meaning they will not bite a suspect who surrenders. Police dogs are highly trained and are known for the strong bond they share with their handler, whom they live with while off duty. “I wanted to honor the important work these K-9 units do to keep our communities safe, and personally thank these officers for their service,” said Keith. Dog licenses are on sale from December 1, 2018 through January 31, 2019. For dogs that do not work with the police, the license fee is only $20 for spayed or neutered dogs and $24 for dogs that have not been altered, although there are some exceptions. Dog licenses must be renewed annually, unless the owner has a three-year or permanent license, which can only be purchased in-person from the Auditor’s Office. Dog licenses help reunite owners with their pet if it goes missing, because they can be used as a quick and accurate way of notifying the owner if a dog is found. It is also Ohio law that all dogs older than three months of age must be licensed.